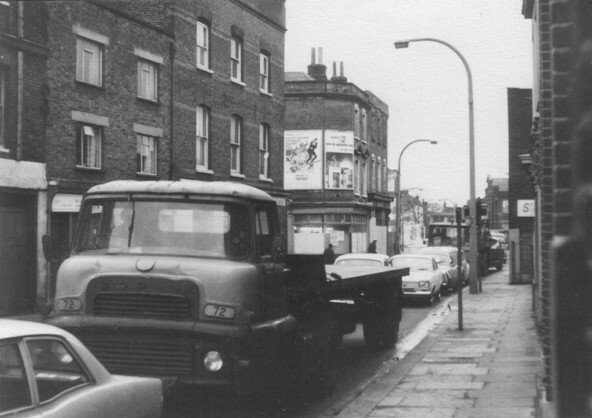 Quentin Pickard has provided this photo taken from a little to the east of Half Acre, 'High Street ... was always renowned for its traffic jams'. The building with the advertising posters was a cafe at 233 High Street, on the corner of St Paul's Road, it was closed by the time this photo was taken. Buildings beyond on the left side of High Street had already been demolished and eventually the International Stores supermarket was built here in 1983. One poster is for the James Bond film 'On Her Majesty's Secret Service' released in 1969 suggesting the photo was taken this year or maybe 1970.